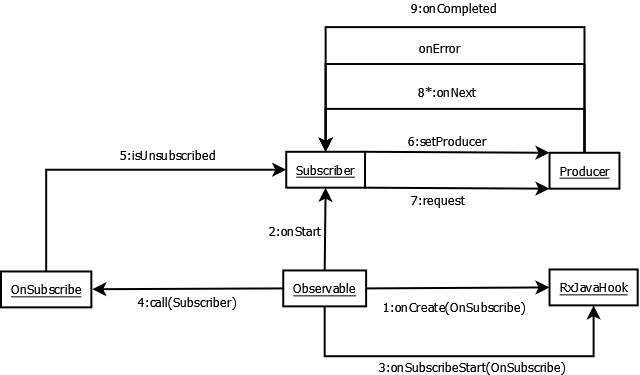 Observable is the main class that the reactive pattern is built on. In this article we will build an Observable object from a list of objects and then a subscriber that subscribes to it. As soon as the subscriber subscribes to it, the Observable starts emitting the items in the sequence. The source of items is the list of objects that we have passed on to create the Observable. Below code converts an Iterable sequence into Observable. from() operator is used to convert an Iterable, a Future, or an Array into an Observable. Let’s first create a simple Observable from a list of values and then subscribe to it. The subscriber simply prints the values emitted by the Observable. In this example, we will plug in an execution hook just to get a feel of the different lifecycle points of Observable execution. The default implementation will be a pass through one which will not do anything. One can use execution hook for metrics or extra logging. System.out.println("OnSubscribe.call called for subscriber "
In our next example, we will see how to request a certain maximum number of emitted items from the Observable. This way we can control the number of items an Observable is emitting. In the below diagram we show the different RxJava components involved and how they interact with each other as soon as an Observer subscribes to an Observable. The above interaction between components can also be viewed in form of a sequence diagram. 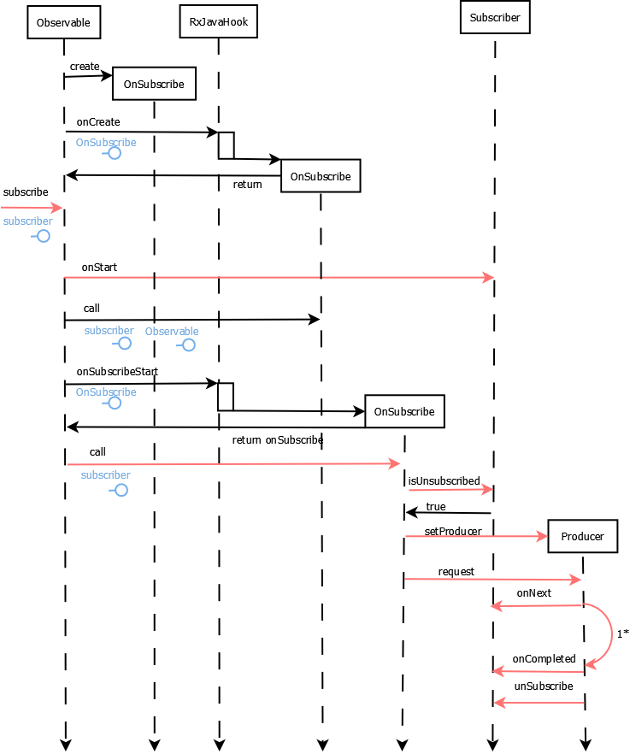 As you can see from the above sequence diagram, there can be zero or more onNext calls to the subscribed observer instance, depending on the number of items emitted, optionally followed by a single success or failure resulting in either onCompleted or onError. For simplicity sake, we have only shown the success scenario in the above flow. This was an example of RxJava creating Observable from Iterable.